A longer improv and edit inspired by this modular bebop sketch. This track started out as a test for my old Boss SE-70 Super Effects Processor - the kitchen sink FX box from the 90’s, loved by The Prodigy - which I had dusted off to check out the pitch shifters. A medium-paced Wogglebug conducted two Plan B Model 15s and Maths. There was a bit of FM and wave-folding involved. I’ve always felt that the Wogglebug had the jazz so it was a short jump of the imagination to add some Rhodes/ Cwejman RES-4-ish tones from a Clavia G2 Voice Filter patch and some brushed beats. I guess this was an exercise in re-contextualisation - hope you enjoy it! A second round of applause for hosts Hainbach & Goldwiener and their lovely assistant Paul Da Fonk for a fab time at Berlin’s 2nd Powwow stream at Patch Point! 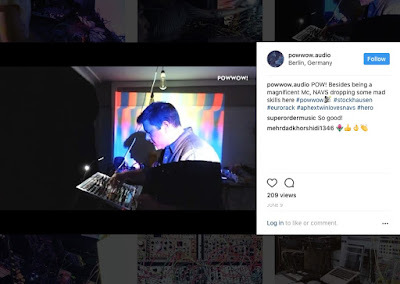 Get ready for the 3rd Berlin Powwow event, also on Youtube, on Friday, July 21st with music from Ashley M Puente, Hainbach, Goldwiener, Lindred and Navs and featuring the knock-out visuals of Luma //Chroma! Navs Live on Berlin Powwow Stream Tonight! I’m taking part in the second Berlin POWWOW live video stream this evening, Thursday, 8th June. 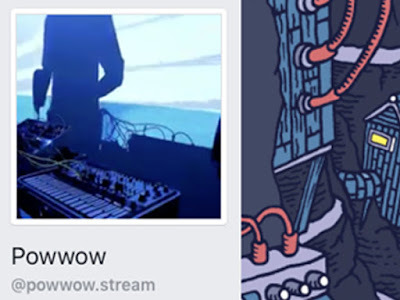 It’s a live modular improvisation over the internet also featuring Andrea Lange, Hainbach, Goldwiener, a special surprise act and visuals by Luma //Chroma. The first Berlin session was loads of fun - join us for part two tonight!